In the Guardian, Jonathan Freedland writes that liberal interventionism is “fine in theory” but goes wrong “in practise”. I’d suggest that it goes wrong in practise because it’s deeply flawed in theory. 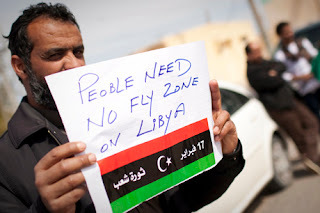 March 25, 2011 -- www.mikemarqusee.com -- The hypocrisy, double standards and selectivity displayed in the Western military action in Libya defy enumeration, but just for a start…. In Yemen and Bahrain Western-backed regimes are violently repressing the democracy movement the West claims to back in Libya. In Iraq a US-sponsored regime protected by 47,000 US troops is trying to do the same – shooting demonstrators, detaining thousands and subjecting many to torture. "The Treaty of Brest-Litovsk was indeed a compromise with the imperialists, but it was a compromise which, under the circumstances, had to be made... To reject compromises 'on principle', to reject the permissibility of compromises in general, no matter of what kind, is childishness, which it is difficult even to consider seriously... One must be able to analyze the situation and the concrete conditions of each compromise, or of each variety of compromise. One must learn to distinguish between a man who has given up his money and fire-arms to bandits so as to lessen the evil they can do and to facilitate their capture and execution, and a man who gives his money and fire-arms to bandits so as to share in the loot." Malaysian socialists: 'Imperialist powers hands off Libya! 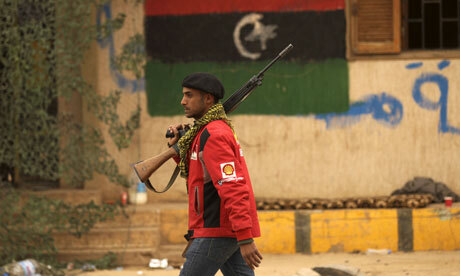 Solidarity with people’s uprising in Libya and Arab states! 1. The Socialist Party of Malaysia (PSM) strongly denounces the imperialist military intervention in Libya. The so-called “humanitarian” intervention serves nothing to protect civilians or prevent loss of lives or support democracy in Libya, but only the effort of Western imperialist powers to secure their interests in the oil-rich country as well as to contain the spread of Arab revolutions. The bombardment on Libya has an ultimate aim by the imperialists to destroy and derail the revolutionary waves in the Arab world. 2. The United Nations Security Council Resolution 1973 passed on March 17, 2011, has authorised the United States, United Kingdom, France and other imperialist powers and their allies to enforce a “no-fly zone” by launching air strikes on Libya, during the eighth anniversary of US-led invasion on Iraq. March 23, 2011 -- The situation in the Middle East is now central to the considerations of the Foreign Affairs, Defence and Trade Committee, and was among the topics addressed in the financial review we are debating today. We have been inspired by the success of the Egyptian and Tunisian people in toppling their dictators, and we were hoping that the Libyan people would soon prevail over the Gaddafi regime. However, as we know, the regime has fought back and was making advances, prompting calls for an internationally imposed no-fly zone to neutralise Gaddafi's air force, which was bombing rebel forces. The proposal for a no-fly zone is only one element in the resolution recently passed by the UN Security Council. The motion had a very loose wording, allowing member states to "take all necessary measures... to protect civilians" in Libya. So far the coalition powers have bombed not only anti-aircraft batteries but also Gaddafi's tanks, troops, and even his compound in Tripoli. British Secretary of Defence Liam Fox has not ruled out Gaddafi himself being a target. "Humanitarian" US bombs being prepared for delivery in Libya. March 22, 2011 -- The Congress of South African Trade Unions (COSATU) reiterates its position in support of the legitimate and genuine struggles of the people and workers of the Middle East and North Africa for democracy, human dignity and social justice. In doing so, however, we seek to exercise caution in the manner Western powers claim to be advancing the struggle for democracy in that region. In their own imaginations, military occupation can deliver democracy to the masses. Is it not the same doctrine that failed in Iraq before, Afghanistan recently and is it not inevitably bound to fail in Libya? This can be best described as helicopter democracy, which disempowers the masses in whose name the struggle for democracy is waged and renders them spectators as foreign powers arrogate themselves the role of liberators, in the process, relegating the masses and their role in their own struggle. February 22, 2011 -- Solidarity rally in Sydney with the Libyan people in their struggle for democracy. Photo by Kiraz Janicke. See an article about this action here: http://www.greenleft.org.au/node/46782. March 18, 2011 -- The threat of military air strikes against Libya by Britain, France, the US and allies — now supported by a March 17 UN Security Council resolution — may or may not force the despotic Libyan regime of Muammar Gaddafi to stop using its armed forces against the rebel-held city of Benghazi in the short term. However, it does pose grave dangers for the sovereignty of Libya and for the wave of democratic revolts that have swept the Arab world this year. Gaddafi's son Saif addressing the London School of Economics in 2010. March 14, 2011 – Links International Journal of Socialist Renewal -- If Muammar Gaddafi’s wicked son Saif is to be believed, we will soon be witnessing “rivers of blood” in Benghazi to shame even the Middle East’s most murderous tyrants, worse even than Israel’s massacre of 1400 Gaza residents two years ago and its 2006 invasion of Lebanon (although probably shy of the US army’s depopulation of Iraq by what The Lancet medical journal estimated to be a million dead civilians courtesy of oil-crazed Washington’s 2003 invasion). March 13, 2011 -- Green Left Weekly -- Saif al-Islam, the billionaire son of Muammar Gaddafi who was the neoliberal darling of Western governments until only recently, boasted in a March 10 interview with Reuters that forces loyal to his family were now on the offensive against rebel forces. NATO, for its part, has decided against military intervention — for the time being. However, France became the first government to recognise the rebel Interim Transitional National Council (ITNC) set up in Benghazi on March 5. 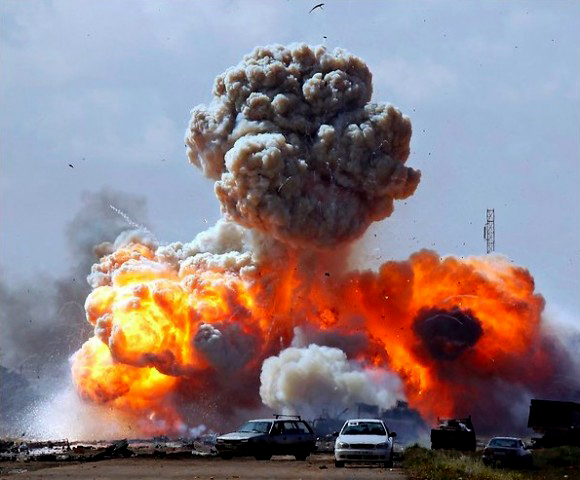 AFP reported that France's President Nicolas Sarkozy has also proposed “targeted air strikes” on Libya. “I am a black South African, and if I were to change the names, the description of what is happening in the Gaza Strip and the West Bank would be a description of what is happening in South Africa” - Archbishop Desmond Tutu, New York 1989. March 6, 2011-- Green Left Weekly -- When Desmond Tutu made this comment, the South African apartheid regime was still in power. In 1994, after 45 years of racial segregation, the apartheid era was officially over. When watershed moments like this occur, multiple factors can be attributed. But history is clear that one of the many reasons this tyranny finally succumbed was an international boycott, divestment and sanctions campaign (BDS).